Skirts are women’s best friends especially during this time of the year when the lovely weather makes you forget about wearing pants. And yes, with all those different styles and colors, you can never have enough of them. So, in case you are planning to buy a new one then maybe you can get yourself a pleated skirt. Pleated skirts are a must for this season and they will for sure make you look trendy. They can be found in different styles and colors, so you will for sure find the right one for you. This type of skirts are more appropriate for women with thinner bodies, because the pleats can somehow add bulk. So, pear-shaped fashionistas should be careful when wearing pleats and the attention shouldn’t be on the wider bottom half. Pleated skirts can be styled with different tops, including shirts, tank tops, crop tops, blouses, graphic tees, turtlenecks etc. So, this means that you can make them part of versatile outfit combos, both casual and formal ones. 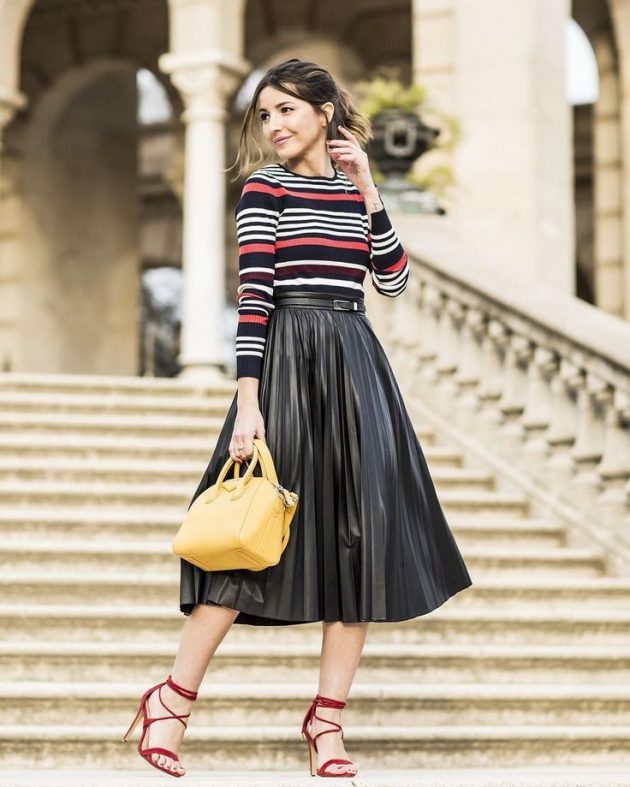 Here are several outfits from your favorite fashion bloggers to show you how you can style a pleated skirt. Enjoy! Depending on the style of your pleated skirt and the way you combine it, you can wear it to the street, to the office and even for a night out. And when it comes to the footwear, this type of skirts can look good with heels, sandals, flats and even with some sneakers when styled casually. Pleated skirts can be found in all colors possible, so may be in doubt of what color to choose. But since this season is all about playing with colors, you won’t be wrong if you pick some vibrant colored skirt or maybe some in a pastel shade. Or to make a bigger statement, you can choose to wear a metallic skirt. So, which one from the above outfits did you like the best? Tell us in the comments and make sure to get yourself a pleated skirt for this season. And of course, stay up to date with the content of Fashionsy to find many other outfit ideas for your style inspiration.